Right away from the opening track, “Eyes Are Open,” you can tell that Tay Jardine is opening the next chapter of her life and is on a new musical journey. SAINTE is a fully realized project with Tay calling the shots and a whole color scheme concept to go with it. 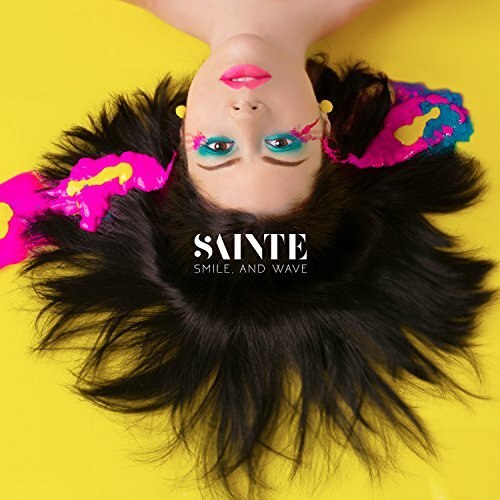 SAINTE takes the pop side of We Are The In Crowd and cranks it up a few notches. You can definitely hear the remnants of the former band, but it’s the first step in what’s shaping up to be a beautiful transition. Jardine’s voice is strong and takes what could be just average tracks to the next level with the power of her voice. The EP is longer than a normal one, but it makes a good statement. It really gives you a chance to see what this band is about—showcasing their range instead of limiting the selection to only a handful of songs. The seven-track release crackles with energy and punch, but though “Lighthouse” is gorgeously sung, it’s a bit of an awkward change of pace compared to the rest of the EP. The synths highlight things on the EP instead of overshadowing, which is awesome compared to a lot of synth use lately. The guitars are strong and you hear instruments, making sure they aren’t losing them in the transition to poppier material. It’s a great thing to hear with the state of popular music today. “White Lies” and “With Or Without Me” are definitely the two best on the EP, with “Technicolor” coming insanely close. They’ve got catchy choruses that are ready for sing-alongs and the lyrics are punchy and sassy. They showcase what SAINTE are doing best, and what they’ll hopefully continue to hone and refine. This band has their blueprint set for the kind of music they want to make, and it’s something the world could use right now. It’s upbeat and enjoyable, with honest lyrics and real instruments. They have a vision and smile, and wave is a great start to fulfilling that vision. Any debut is going to have a misstep or two, but this is a polished piece of pop art that’s got a leg up on the competition. SAINTE are a band you should be watching! smile, and wave is available now.